Paris (VNA) – National Assembly (NA) Chairwoman Nguyen Thi Kim Ngan met with the overseas Vietnamese (OV) community in Paris on March 31 afternoon (local time) as part of her ongoing visit to France. Hailing the association’s 100th anniversary, the NA Chairwoman said the Vietnamese Party and State always pay great attention to implementing the policy of great national unity and consider OVs as an indispensable part of the Vietnamese nation. The State has enacted measures to help the OV community stabilise life and integrate into the host society while preserving and promoting Vietnamese culture, as well as adopted open policies related to nationality, visa exemption, house ownership, investment and business for OVs, she added. As a legislative body, the NA will continue accompanying the Government and localities to remove difficulties and create all favourable conditions for OVs to return home for making investment, doing business and transferring technology, Ngan affirmed. 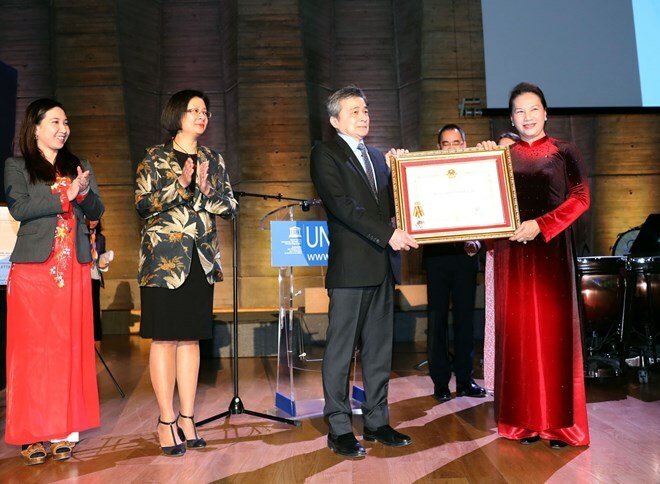 The top legislator recognised the significant contributions of the Vietnamese community in France to the cause of national liberation and building in Vietnam. The association of Vietnamese people in France, the successor of the group of Annamite patriots founded by late President Ho Chi Minh in 1919, is a vivid illustration of the Vietnamese Party and State’s policy of great national unity, she said. She took this occasion to present the first-class Independence Order to the association in recognition of its remarkable achievements in building, reinforcing, and developing the OV community in France.